President Obama’s visit to the City of Flint this week is hoped to bring a sense of urgency to the water crisis that has been ongoing for two years. While infrastructure issues need immediate action, it is imperative to determine the presence of other heavy metals in the residents themselves in addition to lead levels. Dose levels are multiplied when both lead and mercury are present. Because the toxicity of dental mercury is not adequately acknowledged by mainstream medicine, the doctors who will be examining the Flint population, especially children, for effects of lead poisoning will likely not be aware of the potential elevated toxicity. Health professionals also need to determine the amount of mercury burden each person carries. This would be done by evaluating the amount and size of mercury amalgam fillings in each man, woman, and child. According to Mark Richardson, PhD, project leader in a study of combined heavy metal toxicity, found that when lead and mercury are both present, it creates a synergistic toxic effect. Mercury vapor, methylmercury and lead all cross the blood-brain and placental barriers, are completely absorbed in the gut and lungs, and all cause neurological harm. The combination of the toxins need to be added together to accurately measure the allowable limit of exposure. Furthermore, if all three toxins are present, then the safe dose of each reduces to one third of the allowable limit. The evolving tragedy in Flint brings up similar feelings of disbelief, outrage and helplessness felt by people who are involved in the fight against the use of mercury in dentistry. 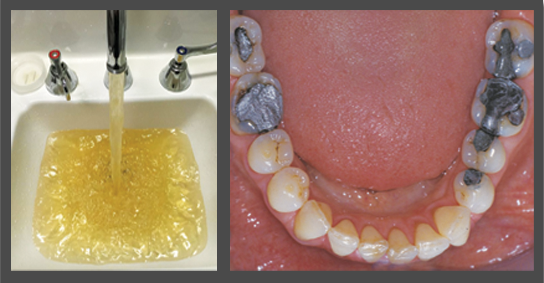 How is the Flint situation different from the ongoing poisoning of patients and dental staff from the use of dental mercury? Both involve the chronic, systematic poisoning of a population, even with the awareness of government officials and an abundance of scientific evidence. TALKInternational.com urges the health professionals of Flint to assess the amount of mercury in each resident’s body and consider the removal of mercury amalgam fillings that pose the increased danger of toxicity. To learn about the symptoms of heavy metal toxicity, take our online survey .